In the mid-1960’s, it became evident that a Catholic Community was needed in the Casselberry area. Bishop William Borders, first Bishop of Orlando, identified about 300 Catholics from the existing parishes of St. Mary Magdalen, Sts. Peter and Paul and Nativity. At the same time, the Augustinians from Villanova, PA had contacted Bishop Borders. The province was looking to work in the South. Bishop Borders contacted the Provincial, who volunteered to send men to serve in the Orlando Diocese. Father Jim Martinez, O.S.A., was designated to be a pioneer in the southern mission, and first pastor of St. Augustine Parish. Father Martinez was housed at the Cathedral Rectory since there was no Augustinian presence in the area. Father Martinez contacted the 300 identified as future parishioners. The first parish meeting was held at St. Mary Magdalen Church. St. Augustine’s Day celebration was held at the new Augustinian residence. The parish membership continued to grow and the liturgy site was changed to the Cinema in Seminole Plaza. In 1971, ground was broken for a multipurpose building to serve all of the parish needs, particularly liturgy for the still-expanding parish. The first Mass in this building was held on July 25th with Bishop William Borders presiding. On St. Augustine’s Day, 1978, ground was broken for the first existing church. The first Mass was held on Christmas Eve, 1979. The dedication of the church was held on May 4th, 1980, with Bishop Thomas J. Grady presiding. In 1986, a new parish center was opened to accommodate numerous meetings, socials, programs, and parish gatherings. The center was dedicated on St. Augustine’s Day, August 24th, 1986. In 1988, the parish hall was renovated to serve as a religious education center, and in 1992 expanded for business offices. Since the beginning of St. Augustine Parish, traditions have been established and faithfully maintained. The annual St. Augustine’s Day celebration in August was begun as soon as there was a parish building in 1969. This event is held every year with various activities to enrich the social and spiritual life of the parish. The real history of St. Augustine’s Parish is that of a people called together in the love of God. 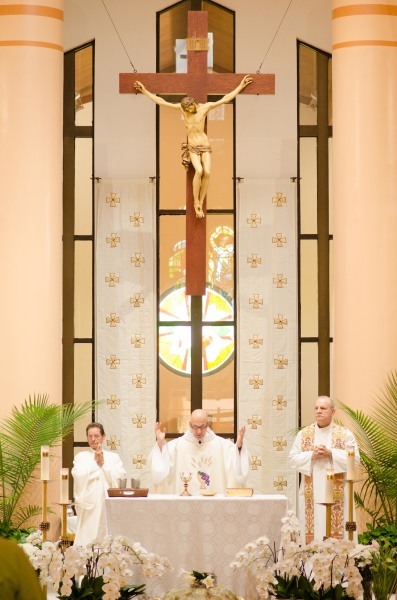 St. Augustine Parish Community started with a handful of dedicated, visionary families who, with the leadership of the Augustinians and the Diocese of Orlando, have become a strong community dedicated to God, to the community and to each other. St. Augustine Parish was founded in Casselberry with Father Jim Martinez, O.S.A., as first pastor. Approximately 60 families gathered together for the first Mass at the Casselberry Women’s Club. The location of the Sunday Mass was changed to the Cinema Theater in Seminole Plaza. Ground was broken for a multipurpose church hall to accommodate the growing parish community. The first Mass was celebrated in the parish hall. Formal dedication took place on July 25th, 1971, with Bishop William Borders presiding. Ground was broken for a church on St. Augustine’s Day, and the first Mass was held in the new church on Christmas Eve, 1979. Formal dedication of the church was held on May 4th, 1980, with Bishop Thomas J. Grady presiding. Dedication and Blessing of the new Parish Center on August 24th, 1986, with Bishop Thomas J. Grady presiding. Remodeling of the parish hall to serve as a religious education center. Expansion of the parish hall for the business offices. Stained glass windows from the Newman Center of Rollins College were donated for the Blessed Sacrament Chapel in the church. Renovation of existing church, including expandsion of the Altar, Narthex, and Gathering Room. The addition of a prayer chapel and permanent Baptismal Font highlighted this project. Rededication of the renovated church building by Bishop Thomas G. Wenski on the feast of St. Monica.